As per the Aadhar Statistics the Rajasthan population in 2019 is 78,230,816 (78.23 Millions) as compared to last census 2011 is 68,621,012. 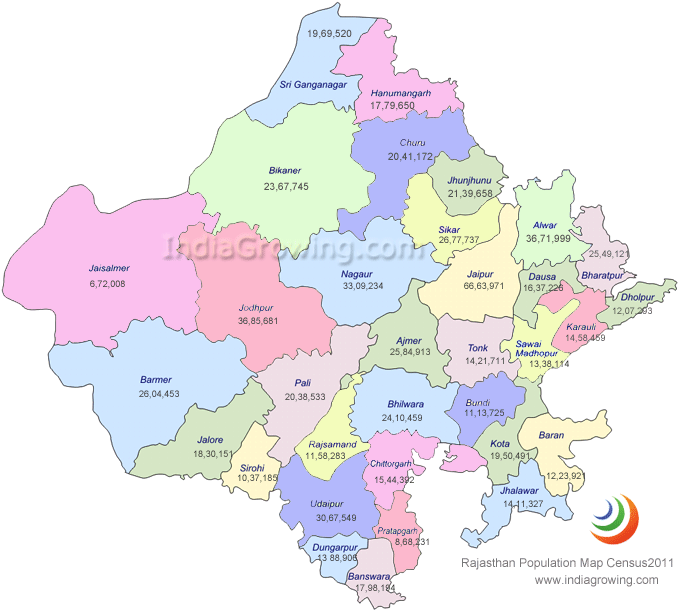 Growth rate of 14.00 percent of population increased from year 2011 in Rajasthan. till 2018. Rajasthan is India's largest state by area with 342,239 sq km and is divided into 33 districts. Jaisalmer is the largest district with an area 38,401 sq km. Population wise Jaipur is the capital and district with around 6,663,971 people living in this district as per 2011 census. Jaipur is the Capital of Rajasthan in india.